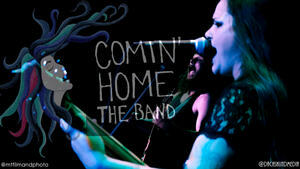 Comin’ Home The band is made up of Tony and Amberle Madden. We are based out of Central Florida. Our music has been described as rockin’ blues, but mostly considered a thing of its own. Amberle writes most of the lyrics, is a lead singer and bassist. Tony writes and plays the guitar and sings. Through our music we wish to reach people emotionally, so they know they are not alone, to inspire people to follow their dreams and be the best version of themselves they can be, all the while showing that you can do it your own way. It is important to us to live what you preach, so because we believe that you get what you give, we always try our best to give everything we can. This is one of the main reasons our music is free and our merch is pick your own price. We also believe that everyone should be treated as equal, so by approaching the ‘sales’ of our music and merch this way, we give everyone at all levels of life the same access to everything Comin’ Home. Our hopes and desires are to touch people and through that pave the way to hit the road permanently in a state of constant tour, sharing our music where ever we go and in our own way, making the world a better place. We aren’t striving for fame and fortune. We are striving to live a life, through our music, in the most authentic and positive way we can; shinning a little light in the darkness. The biggest hope is to create a living breathing connection with our fans, and because of that our dreams and passions are supported 100% by the voluntary generosity of those we touch along the way, and that one day that might be big enough that we can use the excess to really make large scale contributions to all the many causes that need funding. If we boil it down, what we want is to make the world a better place for those of you that we can, and live up to our highest potential through doing the one thing that makes life amazing… Music!